<br>The Hunt is on! Combining authentic hunting gameplay with an innovative motion-sensing rifle controller, Bass Pro Shops: The Hunt is the most exciting hunting game to hit next-gen consoles. You will experience the thrill of the hunt while you stalk and kill your prey in some of North America's most famous hunting spots. 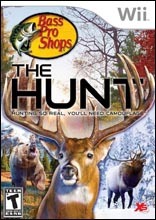 With local multiplayer, arcade mini-games and season hunt modes, BPS: The Hunt is fun for gamers and hunters alike.